An artist’s impression of the proposed development. 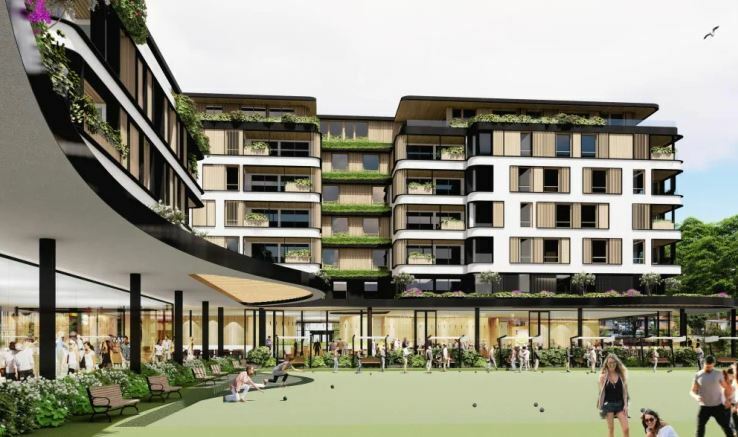 The new wave of consumer advocacy: The Eastern Suburbs Leagues Club wants to demolish Waverley Bowling Club and one of its bowling greens to build a 90-unit retirement village and a 76-place childcare centre across four buildings up to seven storeys high. But the Save Waverley Bowlo community group says it has concerns about the height of the development, its effect on traffic and the reduction of open space. “The community would like to see as much of the land maintained for community use, while ensuring the Easts has an economically viable venue,” its spokesman Mark Nathan told The Sydney Morning Herald. A spokesman for Easts says the redevelopment is required to save the Club, which only had around 60 active members and has been trading at a “significant deficit” since it was acquired by Easts in 2010, from imminent closure. As we covered here, the Club already fought off one attempt to relocate it to the Bondi Golf and Diggers Club in 2017. Which is preferable, seniors housing and childcare facilities or closure?